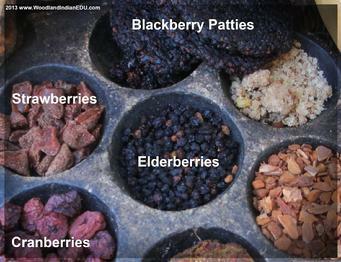 The historic Eastern Native Peoples employed cooking and food preserving technologies that suited their lifestyles well. 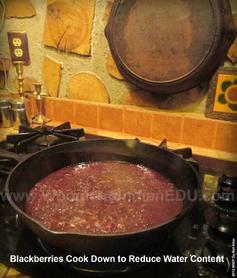 Part of this know-how was the ability to preserve berries. This was usually accomplished by dehydration. Berries said to have been consumed included blackberries, raspberries, cranberries, blueberries, huckleberries, mulberries, sumac berries, elderberries, strawberries, and shadbush berries (aka service berries or june berries). Some berries were probably strung and suspended from the rafters of the home to dry (cranberries being a prime candidate), others may have been hung to dry on their cut branches (as noted to be done with blackberries by the Iroquois), but the usual method was to lay the berries out on reed mats, birch bark, or in wide baskets in direct sunlight where they could quickly dehydrate. While this could take place on the ground, the inherent danger of ground bugs, village dogs, and sweet tooth toddlers probably made doing such difficult. Grill style drying racks and raised platforms were a much more secure place for this job. Village fires that generated smoke around the drying areas probably also helped to discouraged thieving birds. But fires could offer the drying process more than just traces of smoke in the atmosphere; smoke was used as a tool of preservation for many foods. The grill racks that dried meats and vegetables could be converted to handle small berries quite easily. The Ojibwa, for example, are noted to spread field grass over the smoking frame to a thickness of about three inches. This created a foundation to cradle the small berries, while allowing the low heat and smoke from a small fire below to penetrate through the grass and reach the berries above. 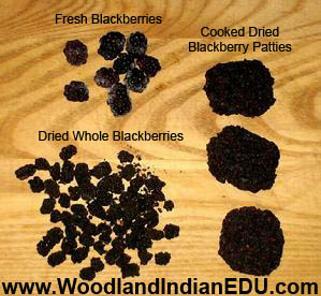 Once whole berries were fully dried, they could be kept whole or easily broken down into a meal. The historic Ojibwa were noted to store dried blueberries and wild rice together in cedar bark woven pouches, which where cooked together when desired for a meal. The Iroquois were noted to traditionally rehydrate dried berries in cool water before slowely heating the berries up for a cooked dish (such as sauce, corn bread batter, and hominy). Berries could be broken down before they were dehydrated. The Iroquois did this especially with strawberries and raspberries, mashing the berries in mortars and laying the resulting berry-mass on basswood leaves (possibly to dry) while drinking the leftover juice as a drink. The Ojibwa were also known to mash the fresh berries (seeds and all) and cook the jelly-juice over the fire to concentrate it. The resulting semisolid was formed into patties in the hot pot, and then laid out in the sun to finish the drying process. After the drying process was finished, and the hard berry cakes were stored away for later use. Such patties were broken down and added to breads, puddings, rice dishes, and even beverages for flavoring. established, but it may be purely the taste of maple sugar which they wanted to save alone and unadulterated, and their confirmed preservation techniques that may have given the Native Peoples no reason to change their berry preservation to include preserves. Essentially their technology wasn't broke, and therefore needed no fixing. It would be more correct to question "why would they want to" than question their ability to. But before the case is closed, we have been assuming that there is no direct observation of Native Peoples making preserves, as one source on the New England Native Americans insists for the New England area. But this might not reflect all the Eastern Peoples. In the 18th century, John Heckewelder observes of the Delaware: "They make an excellent preserve from the cranberry and crab-apple, to which, after it has been well stewed, they add a proper quantity of sugar or molasses [these terms have also been applied to maple sugar and syrup]." What's interesting is that this testament appears between descriptions of their methods of cooking squash and making both dry cornmeal bread and green corn breads, all of which are clearly Native treatments of their food. John Heckewelder was a missionary who lived among many Native communities, and usually had a pretty keen eye for categorizing Native customs of Native origins. If he considered this an introduced preservation technique, he would have most likely noted that or kept it out of a section of his writings devoted to describing what seem to be cooking techniques he attributes to the Delaware. The Moravian missionaries were known to introduce quite a lot of customs, but these were not included in the section describing Native cooking, such as making sauerkraut. This description adds evidence of to what may have been some Native communities making preserves to one degree or the other. Indeed, James Smith (who lived among a community of Mohawk, 1755-59) also notes that the taste of cranberries collected by the Native Peoples was more agreeable with sugar. Maybe if any berries were processed into preserves with sugar among historic Native communities, it was the cranberry due in part to it’s rather sour taste.